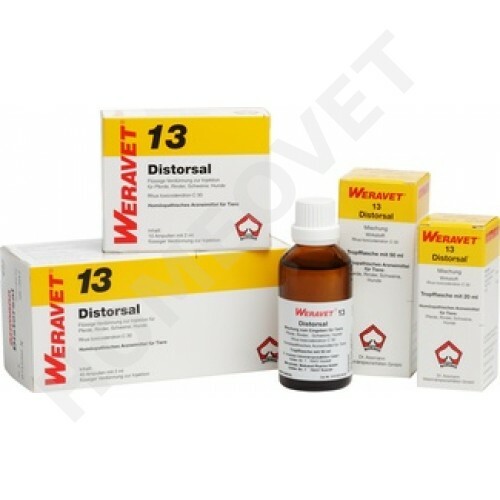 Distorsal, Homeopathic medicine for cattle, horses, pigs, dogs and cats. To use as a regulation therapy in lameness, bruises, contusions, tendonitis, joint and muscular rheumatism. Distorsal® contains Rhus tox, poison ivy (Anacardiaceae family). The shrub is native to North America, and finds itself increasingly in European gardens. For the homeopathic preparation, the fresh leaves are used. Especially with horses and dogs Distorsal® has proven to be effective in the treatment of lameness. Indications in horses also include diseases such as lumbago, spavin and tendonitis. With dogs Distorsal is helpful in the treatment of osteoarthritis and disc herniations of elderly patients who are stiff when rising but loosen up with activity. General: Great weakness, all over his body paralyzed. Great restlessness, constantly have to move. The animal appears depressed and unhappy, anxious. In acute conditions, the injection should be repeated after 1 – 2 days; otherwise, repetition takes place after 4 – 8 days. Administration of the drug should not take place longer than to the complete healing of the animal. In acute or serious complaints one should seek medical advice from a Vet. Dissolved in the drinking water or bread or in about 10 ml of water over the feed. 2 times a day until healing, administration of the drug should not take place longer than to the complete healing of the animal. In acute or serious complaints one should seek medical advice from a Vet.